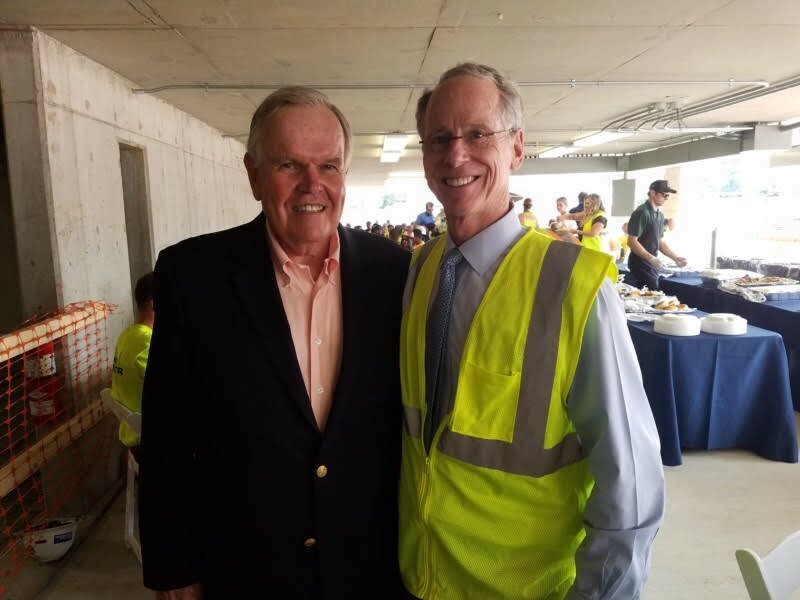 On Monday afternoon, around 200 construction workers, engineers and architects gathered inside the Harpeth Square parking garage for a catered meal from Moe’s Original BBQ to top off the project’s parking garage and hotel. Walker Mathews said his company hosts a similar celebration party for each large project they help create. “We just pick a certain point in the progress of the project, really to just be able to thank our workers,” he said. Mathews said 200 workers had contributed to building the project, a boutique hotel, luxury apartments, a garage and office space. He anticipates they will max out at 300 workers. Roderick “Rod” Heller said the Harpeth Square team will host an official topping out ceremony for the project in October, one year after ground was first broken on the $110 million project. A topping off is a celebration to commemorate the highest layer of a building being completed. Project architect Meredith Bucher of Smith Gee, owner and principal Mike Hathaway of 909 Studio Architects and managing partner Russell Skrabut of Genesis Engineering Group were in attendance with their teams.